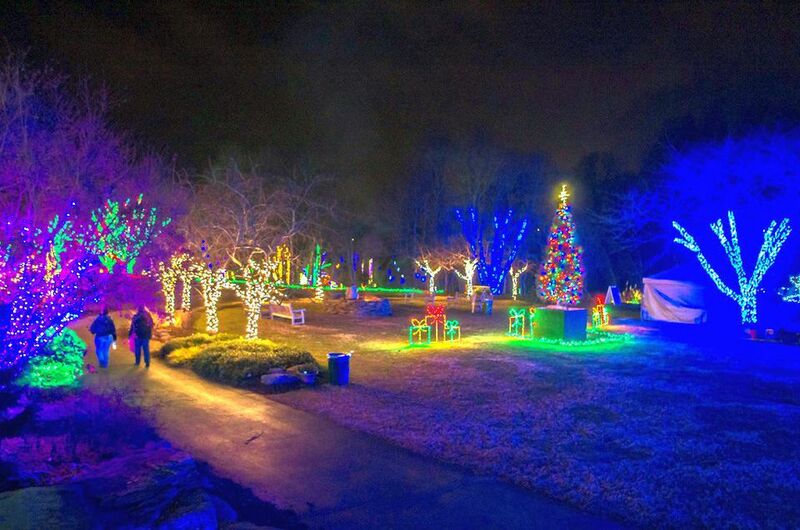 For the holiday season, Meadowlark Botanical Gardens in Vienna, Virginia is hosting a Christmas light display called a “Winter Walk of Lights.” The walking tour includes 500,000 LED lights and unique animated displays with a nature theme such as a bubbling stream, jumping fish, deer, and dragonflies. There will also be seasonal displays including a Gingerbread Village and a pumpkin patch. Dress for the weather and wear good walking shoes. The garden path is about half a mile long. Meadowlark Gardens is a 95-acre botanical garden operated by the Northern Virginia Regional Park Authority. The complex includes unique native plant collections, walking trails, lakes, gazebos, a visitor center, and a restored 18th-century cabin. Winter Walk of Lights takes place November 9, 2018, through January 6, 2019, from 5:30 to 10 p.m., seven days a week. The event is open rain or shine. Timed admission tickets are required and are available online. A limited number of tickets will be sold at the door at a higher cost while they last. The pre-purchase price is: $14 Adults, $8 for ages 3-12 and children under 3 are free of charge. Meadowlark Botanical Gardens is located off of the VA-267 (the Dulles Access Rd). Take Exit 45A toward Wolf Trap, make a U-turn, turn Right to stay on Trap Road, Take the 2nd Right onto Beulah Road, follow the road for .8 miles and the gardens will be on the left. Children can search for a variety of animals and other fun displays along with their Winter Walk. Ask for a Light Search activity sheet at admissions in the Visitor Center. Children, who complete this activity, can get a neat holiday sticker when they turn it back into the Visitor Center before they leave. There are light refreshments concessions for hot (coffee, cider, and hot chocolate) and cold beverages, s’mores kits, marshmallows, and popcorn at the gardens. You are not allowed to bring food into the event. Ristorante Bonarroti, an excellent Italian restaurant and wine bar. The address is 428 Maple Avenue East, Vienna, Virginia. For something informal and quick, try Super Chicken, a Peruvian-style chicken restaurant in Tyson's Square. The address is 8357 Leesburg Pike, Vienna, Virginia. Also in the area is Nostos, a Greek restaurant with hearty Greek food and a good Greek wine list. The address is 8100 Boone Blvd, Vienna, Virginia.